Lodge Canyon is one of the dryer canyons in Zion National Park. The route begins in Upper Pine Creek, then heads up the slickrock following the Mountain of the Sun Route. It breaks off and heads through and canyon ending near Zion Lodge. Equipment: Sticky rubber shoes, harness and descending device, emergency ascending gear, a helmet, two 200' ropes, 30' extra webbing, at least 3 liters of water per person, plenty of energy foods. Technical: Challenging rope work gives this canyon a more severe rating. Rappels up to 190' with 15' extended anchor and a missed. A mistake on the 4th rappel could end in a 400' drop. Trailhead: Canyon Overlook parking lot to Upper Pine Creek. Trail Access: The Zion-Mt. 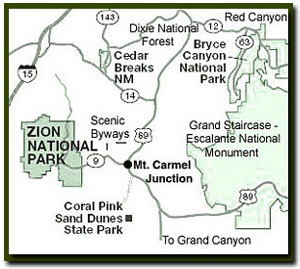 Carmel Hwy is open year-round.Zion Canyon is accessed either by the Zion Canyon shuttle or by private vehicles year round. Best Season: April to October. Its difficult to climb the slickrock if the black moss on the slickrock is cold and wet and the canyon is hot in the summer. Never enter a technical canyon without the knowledge and skills needed to safely explore and return. Rappelling and downclimbing skills are required to navigate through Lodge Canyon. Do not jump. Jumping in Zion's canyons have resulting in many broken bones. Many technical canyons, such as Lodge Canyon, also requires excellent map reading skills to navigate. Car Shuttle - Park one vehicle at Canyon Junction, the museum or the visitor center (if shuttles are running otherwise park at the Zion Lodge) and the other at the Canyon Overlook parking lot located on the east side of the Zion Mt. Carmel Tunnel or park at the Canyon Overlook parking lot and hitchhike back to your car after the hike. Call the Zion Canyon Visitors Center for weather conditions prior to the hike: (435) 772-3256. Hiking in slot canyons presents a very real danger from flash flooding. Do not hike this trail if it is raining. Remember a storm far off can trigger a flash flood. Mountain of the Sun Canyon has a low flash flood danger. This a wonderful hike with a short slot section and a handful of rappelling, all of which takes place at the end of the hike. The slickrock approach and the unusual canyon contains a unique beauty. Bo Beck on free rappel in Lodge Canyon. Lodge Canyon Trailhead - Walking east from the tunnel, the first drainage to the left is Shelf Canyon. Continue up the road to the next drainage, located .4 miles from the tunnel. This is Upper Pine Creek. Drop down into the sandy bottom of the drainage and hike north for about .5 miles to the waterfall. Just past the waterfall is the best location to climb up (west) the slickrock. Note how the rock curves down, just to the left of the waterfall. Water runs through Pine Creek so prepare to get your feet wet. Steep Slickrock Scramble Uphill - Pick your way up the weaknesses always being aware of ledge systems that make the travel easier. Soon there is a fairly steep section that wants to draw you to the right, but if you continue up and to the left on the steep slab, the travel soon becomes much easier. You will eventually gain a plateau and much easier traveling as you bear to your right a bit. Aim for a large drainage in the center of what is soon to become a large slickrock basin. Once inside the basin aim for the right (north) side of the basin where you will find ramps that will take you up higher into the basin. Staying on the right side of this bowl will afford weaknesses in the form of north running ramps. At a point almost at the top of the saddle there is a fairly tall (25') wall that contains a panel of petroglyphs. Its one mile at this point. Travel the ramp up and to the right of this panel where shortly you will arrive at the saddle with views to the west, of the West Temple looking thru Spry Canyon. The East Temple is to the left, Twin Brothers to the right of Spry Canyon, and Deertrap Mountain to the north. The views looking east and south are magnificent showing the diversity of the eastern Zion terrain. Enter the canyon floor, just behind Twin Brothers, but instead of going left towards Spry Canyon, turn right up the wash at the bottom of the rock face of Twin Brothers. There may be a slight amount of bushwhacking, but the going is easy as the incline to climb is moderate. After following the wash for less than .25 miles you will top out on a sharp, prominent saddle that divides the direction of flow of washes. For the next .5 mile or so the descent will be steep and bouldery. Route finding the easiest way down becomes the norm. Soon after, the canyon floor yields to gentler travel and slowly the canyon opens and closes. At .7 miles from the saddle the canyon opens to a large slickrock clearing. This is a good place to enjoy the beauty of the slickrock potholes, relax and enjoy some lunch. Its here that one would look back up the canyon just traveled and notice on the right, a large slickrock ridge that rises to the south from where you stand. This would be the route to follow if taking a side trip to the summit of Mountain of the Sun. Facing downstream, one might notice a small foliage choked wash entering on the left, seemingly draining from the base of Mountain of the Sun. Traveling up this wash a short distance bears an amazing cave that will provide cool shade during a hot day. It is very dark and continues back to a chamber. A must to see before continuing north down the wash towards the Mountain of the Sun Canyon. Lodge Canyon Technical Section - Rappelling skills are required to navigate through this slot canyon. Remember slot canyons can change dramatically in a short time due to flash floods and water levels in this canyon change. These directions are only a general reference. Be prepared for variations in the canyon. First Rappel - Traveling another .7 miles will finally bring us to our first rappel. As you walk onto a large slickrock wash that veers to the right and to the base of the sheer rock wall of Deertrap Mountain, cut left through the brush but stay as close as possible to the forming slot canyon on your right. 100-150 meters of walking through the brush, look for a pine tree perched on the very edge of the vertical wall slot canyon below. A sling around the tree will indicate your first 140' rappel into the "slot". The last person over may wish to bring the knot over the lip below as to not get your rope stuck on the pull-down. Second Rappel - At the bottom of this rappel walking down stream 50' and staying left of the boulder in the wash brings you to a 2 bolt anchor for the next 150' rappel. Once again, bring the knot over the edge to make the rope pull easier if you wish. Third Rappel - Just another short jaunt shows the 2 bolt anchor on the right rock face and another drop (some may downclimb this, not recommended) of 35'. Forth Rappel - Pull your rope and set up the next rappel from the 2 bolt anchor on the right again just a short distance away. Now here is where problems could arise. On this 4th rappel, the watercourse wants to take you down vertically, but as you are rappelling down, after about 30' a large ledge will come on your left as you are facing into the wash. You must sidestep and pull yourself over to this ledge, as the anchors for the next rappel are on the far side of this ledge. If you have made a mistake and rappelled past the ledge you must ascend back up, as the drop below is close to 400'. Fifth Rappel - From the ledge a 2 bolt anchor with an extra long long sling is present that puts the anchor point over the cliff edge. Difficulty may arise for less experienced canyoneers when loading the system and to start rappelling. The most experienced person can set up a detachable lower off a belay device and lower the less experienced people until the rope is loaded. Then the more experienced person can carefully downclimb until he is weighting the system. Once again bring the knot over the next edge below to make the rope pull less likely to snag. This rappel is close to 190', however there is an intermediate 2 bolt anchor at 155' if for some reason your rope isn't long enough. Sixth Rappel - The last rappel becomes obvious now off a 2 bolt anchor in the middle of the wash, and it's a beauty of a rappel as you dangle in mid air viewing the gorgeous hanging garden underneath the overhanging rock you will be descending. Exit - Once down, put away the gear, relax for a few and start your way down. The easiest route down is on the left side of the wash, however an exit can be accomplished on the right side as well. Head for the Zion Lodge and go have a cool one now before heading back to your shuttle vehicle that you left either at Canyon Junction, the museum or at the visitor center. Options - Hike up to the peak of Mountain of the Sun.